Discover legendary commanders, tremendous fights, elite soldiers, and courageous individuals whose deeds truly made the difference in this jaw-dropping guide to the biggest war the world has ever seen. From massive aerial battles that clouded the skies with planes to deathly secret operations deep behind enemy lines, the events of World War II are some of the most awe-inspiring of all time. 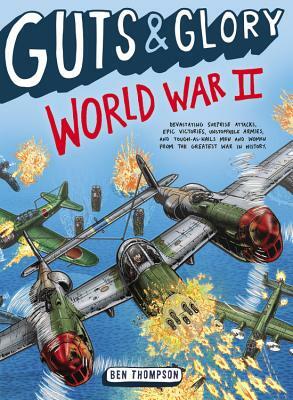 Packed with trivia, epic battles, and amazing illustrations, World War II comes alive for kids like no textbook can in this account from Ben Thompson that's perfect for history buffs and reluctant readers. Ben Thompson is the author of Guts & Glory: The American Civil War and Guts & Glory: The Vikings. For more than ten years, he has been producing humorous, history-related material, including articles for publications such as Military Times and for organizations like the American Mustache Institute. Ben has researched hundreds of World War II heroes for his various projects and is also really good at World of Tanks on the Xbox. He invites you to visit his website at gutsandgloryhistory.com.